The backbone of sound creation in our studio is Yamaha's rack-synthesizerer »Motif ES«. Together with the »Triton Extreme« by KORG Inc., a fully upgraded sequencer workstation keyboard with 61 keys (including MOSS sound expansion), we have access to one of the most powerful sound libraries, which a musician can immagine. The output signal is connected via optical link to the S/PDIF input of the digital console, resulting in the highest possible audio fidelity. For making advances to real piano freaks there is a FATAR master keyboard with 7 oktaves (88 weighted keys with hammer action). 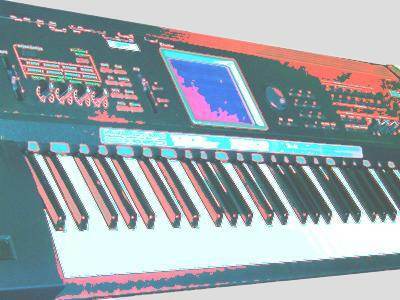 In second place we have the Roland Fantom XR and the EMU Proteus 2000, both highly sophisticated synthesizers with additional sound banks as hardware add-ons, namely »Planet Earth World Music« and »X-treme Lead«. Finally, the lineup of digital sound synthesis is rounded out by the MicroKORG, which at first glance seems to be a rather unimposing little keyboard. The MicroKORG digitally emulates a traditional analog synthesizer with arpegiator and vocoder. This baby produces highly ambitious vintage sounds with extremely cool effects. Also the sampling section of »Hasba Calling Sound System« is pretty impressive as well: Two EMU multitimbral samplers have been rack-mounted with the complete EMU Sound Library and a variety of other sound samples on CD. Including the synthetic sound banks, there are virtually thousands of different voices and instruments on the shelf. Any genre, be it rock, pop, jazz, vintage, hip hop, techno or symphonic orchestra, can be brought to bear from the sequencer.